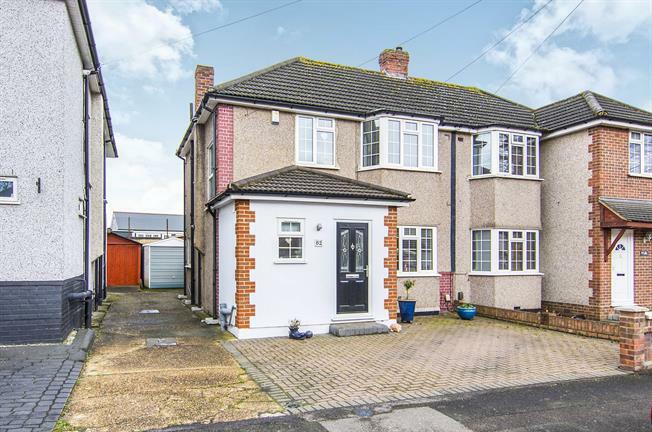 3 Bedroom Semi Detached House For Sale in Hornchurch for Asking Price £415,000. This stunning three bedroom semi-detached home has been finished to a very high standard and requires no work! Located 0.6 miles from Elm Park Underground station and within walking distance to local bus routes. There are numerous schools nearby such as Benhurst Primary, Elm Park Primary and Abbs Cross Academy. If you're looking for a house to be able to move your furniture in and just live, this may well be there property for you. Downstairs there is a large through lounge, with bay fronted windows, modern fire and patio doors leading to the garden. There is wood effect laminate throughout the downstairs and a downstairs shower room. The kitchen has recently been fitted and has integrated appliances. Upstairs there are three good sized bedrooms, two doubles and a reasonable sized single. The bathroom has a bath, with a vanity unit with sink and toilet. The garden is low maintenance as it has been paved and landscaped throughout. There is a shared drive to garage and parking at the front for two cars at the front.